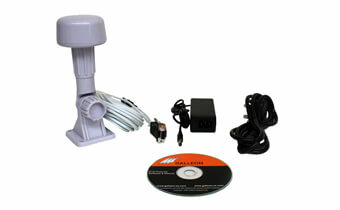 The AC-400-GPS is mains powered GPS antenna that can track up to 8 satellites. The antenna can be positioned up to 15m away from the computer (10m supplied) and connects to the computer by a serial interface. The supplied software driver synchronises the time on a single Windows Server or Workstation and can also synchronize PC's, workstations and other NT servers across the network. AC-400-GPS Receiver + power supply.